I import elements.less , but Web Storm 6 Code Completion can't show mixins defined in elements.less file. the default File Watcher template of less file point to node.exe without path of "lessc", and with a unrecognized parameter "--no-color". Where could I change this? Unfortunately I can't reproduce this problem even without import of elements.less (see screenshot). Could you please provide additional information? Source file, project structure, etc. Is it reproducible for any project? This problem only happened on my office computer, windows version Web Storm 6. In my home, on my own MacBook, Mac version Web Storm 6 works perfectly.These files are managed by Visual Studio TFS, so element.less file is readonly. I dont know if this is the reason,I will try again tomorrow on my office computer. Should not be the reason indeed. 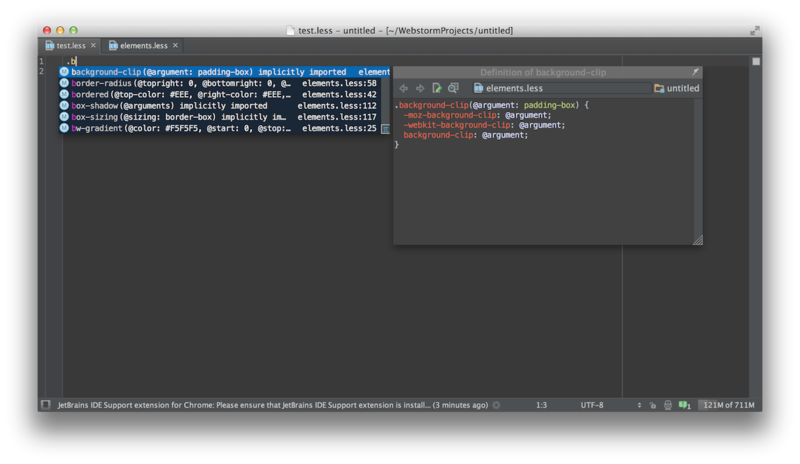 By the way, you can use TFS support plugin for WebStorm (by JetBrains) to work with TFS right inside the IDE. Now it works, I really dont know what exactly happened. Maybe WebStorm need some times to parse these external files? WebStorm needs a little time for indexing your files, but it happens pretty fast (from few second to couple minutes depending on project size). Also, you'll see yellow notification if you try invoke auto-completion while indexing.